The follow up to 2010's massive debut, Opus Eponymous, is a bit disappointing. The group's debut was an eclectic mix of early black metal (think Mercyful Fate) and Sabbath-style doom / occult riffs. Still anonymous, lead singer Papa Emeritus II definitely sounds like a younger Kind Diamond and the infectious grooves of Opus haven't gone stale in three years since inception. This of course got the band to superstardom with a lot of press from Decibel and recently because their initial album art for this album was deemed too offensive by retailers, hence postponing album sales. Whatever the gimmick, nothing matters more than the actual music, which isn't fully delivered here. If you ever were a fan of the band, you may still like this album. Or you may not. Having listened to this album for the last month or so, I am still divided on my opinion of the album. The sound is definitely more polished and crisp, perhaps so much so that the music sounds like a pop album. Not that that is a bad thing, but the result is an album that lacks the balls of the debut. Add to that the fact that the songs are more vague and complex as opposed to short and straightforward catchy. There are still a few hooks here: the brilliant 'Year Zero' and excellent closer 'Monstrance Clock' are clearly inspired by the band's catalogue. On the other hand, you have long unwanted songs like 'Ghuleh - Zombie Queen', a song that starts off with an almost alternative rock crooning and piano before suddenly venturing into some 70s rock segment with elements of swing and organs (with a few seconds of doom rock in an insufficient scream). The idea is not dull but the execution comes out as clumsily handled, and the lack of hooks make the some seem longer than it actually is. 'Body And Blood' doesn't come off as memorable either, with its nonchalant verses and glacial pace. Lead single 'Secular Haze' isn't as instantly accessible as, say, 'Ritual', but it does show the band's shift to pop ambition. 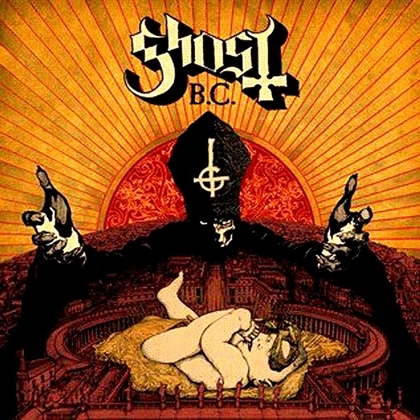 'Per Aspera Ad Inferi' sounds too similar to 'Con Clavi Con Dio' off opus, without being as catchy or arresting, especially because it is the heaviest song on Infestissumam but doesn't juggle the contrasting styles well, abruptly shifting from heavy doom rock riffing to a synthesizer-driven chorus. Much like Baroness' Yellow & Green, the band has definitely focused on their strength; pop accessibility, whilst forsaking the hybrid factor that propelled them to fame. It's by no means a bad album, but one that doesn't do the band justice. Do check this out if you like 70s inspired occult rock though. Or if you didn;t like this check out Jess And The Ancient Ones or Orchid.